Admin 3, Admin 4, Warrick Chambers, Aaron Chambers, Dr Ben Clark, Sue Coglin, Vince Del Nigro, Admin 2 Eden Racing, Dave Gray, Greg Hallinan, Glenn Heffernan, Craig Leggo, David Legudi, Elias Mantinaos, Adam Palmer, Andrew Panasewyc, Nunkeeri Park Syndicate (Mgr: Nunkeeri Park), Charlie Pintaudi, Andrew Ringin, Mark Wells & Sybilla Lighezzolo, David & Lee Tapsall, Princess Park Throughbred Farm, Troy Tranter, Keith Turner, Tanya Turner, Peter Walker, David Watson. A hulking filly that turned heads at the Adelaide Magic Millions Sale - Shea was not going home without her! 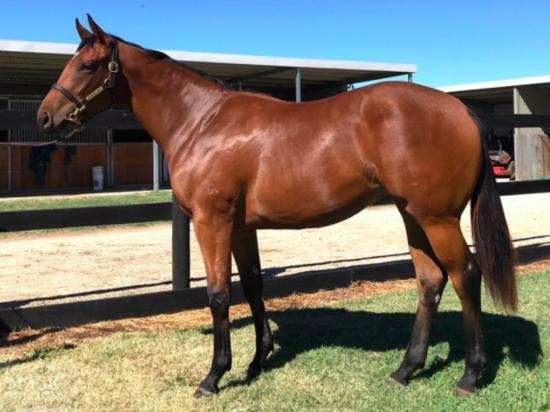 By a former champion European racehorse that is leaving a mark at stud, from a mare that hails from a strong family, this filly has the temperament and physique to make an impact on the track. DAWN APPROACH (IRE) (Chestnut 2010-Stud Ire. 2014, Aust. 2014). 8 wins-6 at 2, The Two Thousand Guineas, Gr.1. Brother to SW Herald the Dawn. Sire of SP Dawn Delivers, Fast Approach, Haddaf, Mary Tudor and of Biz Honor, Court House, Fajjaj, Musis Amica, Perfect Thought, Shrewd Approach, Al Modajal, Moghamarah, Morning Has Broken, Nomorecalls, etc. His oldest Aust.-bred progeny are 2YOs and inc SP Gongs and of Condemned and of the placegetters Daily at Dawn, Skagerrak, Winning Partner, etc. Hoywedge (f. by Choisir). 4 wins to 1300m to 2016-17 in Aust. Sizzling Ace (f. by Sizzling). Placed at 2 in 2017-18, 2d SCTC Coastline BMW 3 Series 2YO P., 4th BRC Calaway Gal S., L.
Eight Over (g. by Lonhro). Placed to 2017-18, 3d ATC Book Spring Hospitality H.
Domain. 4 wins to 1500m in Aust. Illude. 3 wins to 1350m in Aust. Portmarnock. Winner at 1000m in Aust. Pascalino. Winner at 1050m in Aust. Top Bonus. 2 wins at 1200m, HK$2,761,375, HKJC Edinburgh H., Sheung Hei H., 2d HKJC On Ting H., Police Cup, Suffolk H., Lantau Peak H., Lugard H., Wong Cup, 3d HKJC Lai Chi Chong H., HKU Foundation H., Silver Grecian H.
ONE UNDER (Volksraad). 6 wins. See above. I'll'ava'alf. 10 wins from 1950m to 3900m, NZ$80,100, A$227,045, to 2017-18, MRC Crisp S/chase, Hawkes Bay Stella Artois H., Te Whangai Romneys Easter H., 2d ARC Swiss Deli Cornwall H., Warrnambool RC Thackeray S/chase, ARC Broderick Print H., MVRC 1print Tour of Victoria H., Waikato RC Media Works Radio Waikato H., Dunstan Feeds Championship, 3d Warrnambool RC Grand Annual S/chase, Waikato RC Teraparacing.co.nz H., Dunstan Feeds Championionship Qualifier. Kensworth Kid. Winner at 1800m, HKJC Yue Yee H., 2d HKJC Bellflower H., Fa Hui H., 3d HKJC Lusitano Challenge Cup, ATV the 100 Celebrities H., Hankow H.
I'llav Bubbles. 2 wins at 1400m, 1600m, 2d Waikato RC Fairview Motors H., ARC Kitchen Design H., CJC Heatstore H., 3d CJC Majestic Horse Floats H., Hawkes Bay Neil Common-PGGW Livestock H.
Mr Bojangles. 6 wins from 1400m to 4200m, 2d ARC Laura Fergusson Trust H.
Crocodile Hero. 3 wins from 1400m to 1800m in Malaysia, 3d Penang TC President Cup, Clear Mountain Fairview Trophy. Walkin on Sunshine. Winner at 1300m, 2d Waikato RC The Original Thai Restaurant H. Producer. Queensbridge. 8 wins to 1400m, ARC Victoria Racing Club Sprint H., Rotorua RC Okareka P.H., 2d ARC Tecoma H., Matamata RC Panelworks Novice H., Waikato RC Leigh Dunbar World Travel H., CF McCarthy H., Service Foods H., 3d Matamata RC Sky Chase Novice H., McSweeney & Neill Chemists Novice H., NRM Favouritte H.
Leader. 2 wins at 1600m, 2100m, Saint-Cloud Prix de Fresnay, Evry Prix de Casgnes-sur-Mer. ROUGH 'N' TOUGH (Battle-Waggon). 4 wins from 1600m to 2800m, VRC St Leger, Gr.2. FREDERIK (Better Honey). 15 wins from 1600m to 5500m in France, NZ and Aust, WRC Parliamentary H., L, Wellington S/chase, L, 2d Wellington H., L, 3d Wellington H., L.
NENA (Trictrac). 5 wins. See above. GUILE (Otehi Bay). 8 wins from 1400m to 2400m, A$180,338, STC Lord Mayor's Cup, L, 3d AJC Colin Stephen H., Gr.3.